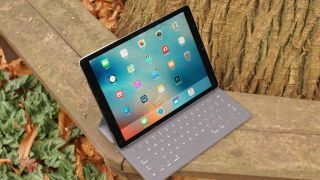 The iPad Pro went on sale last week, and as folks have gotten their mitts on the device, inevitably issues have been aired on the Apple support forums and elsewhere online. So what's the main beef early adopters have found with Cupertino's giant tablet? Certainly one of the major problems seems to be that the new iPad is reportedly shutting itself off while in the middle of charging up. Ubergizmo spotted complaints on Apple's support community, with multiple iPad Pro owners saying that they are hooking the device up to the power to charge, and then coming back to their tablet to find it completely dead and unresponsive – it subsequently takes a hard reset to bring it back to life, which is frustrating many. Some folks appear to be finding this glitch occurring when they've been charging their slate for just a few minutes, whereas others have said it happens after an hour or more of charging (or when overnight charging). Switching out the charger doesn't appear to have made any difference according to one user – so apparently this is a software problem. That theory is further backed up by the fact that some iPad Pro users have claimed that installing iOS 9.2 beta 3 has fixed the issue on their tablets. User K1ckdapro posted: "Second night of fully charging my iPad on 9.2 beta – no freezing. Seems like 9.2 really fixed it! Try it guys, so far I didn't find any annoying bugs in the beta, works as it should!" So hopefully, we should see the back of this issue when iOS 9.2 hits full release, if not before. In the meantime, for those who don't want to mess with beta software, another user (Dr Bgh) has advised that with a nightly charge, if you shut the tablet down before charging, it boots up fine the next morning with no hard reset required. Of course these are anecdotal solutions, so your mileage may vary when trying them. At any rate, we should hopefully hear something official from Apple about this issue being addressed before too long.